Zack brought home the most amazing artwork when he was in elementary school. Although I was completely aware of how talented he was, I was too naive to realize that his art teacher deserved a lot of the credit. 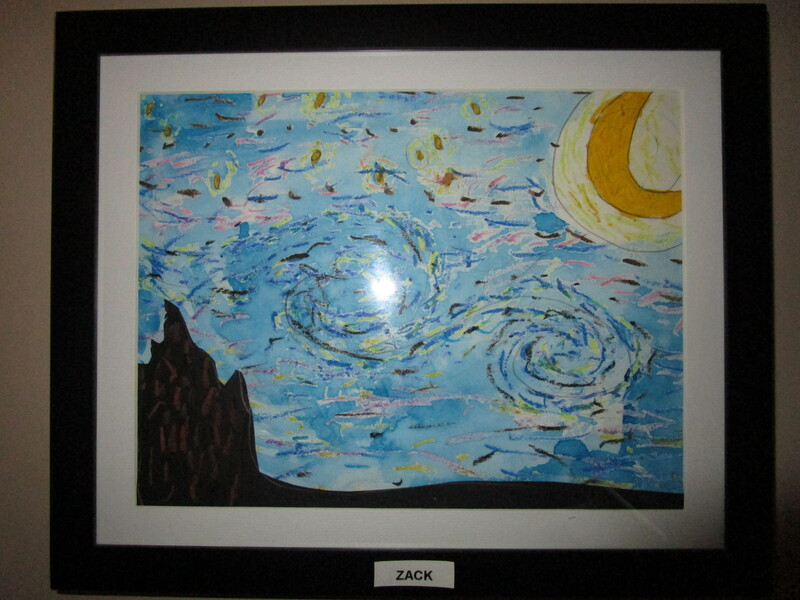 It wasn’t until Zack transitioned to his next school, and was bringing home mediocre art at best, that I realized just how amazing his elementary art teacher was. Although it has an uncanny likeness to the original, there is one thing that has always bothered me about it. When Zack corrected the direction the half moon faces, he barely erased his first attempt. The lines of the old moon are still dark and completely visible. I’ve always wondered why his art teacher allowed that glaring error, why she didn’t make him erase his mistake better. I’m sure if he had tried hard enough, he could have touched it up so his flaw would have been wiped out all together. I have more flaws than I can count; and I have been working on correcting them for years. One flaw is I am not very well spoken. That’s why I write: I can type, catch my mistakes, delete, and try again. Although everyone says you can apologize for what you say, you can’t ever delete the spoken word. It’s always out there. Half a beat later I wanted to delete my words. My comment was completely inappropriate. It was like rubbing salt in the wound. I know it’s not a huge deal, and my words probably haven’t impacted her all that much. But that’s just one of my small blunders. I’m too embarrassed to share the bigger ones, the mistakes I’ve spoken that have inadvertently hurt people. I dwell and I dwell on them, beating myself up. It’s astounding how much energy regret can consume. Sometimes I’m so hard on myself I can’t seem to move forward. That’s where Zack’s teacher and I differ. She’s more accepting than I am. She recognized that if she focused on Zack’s moon mistake, highlighted where he had fallen short, she would have stripped him of his confidence and the motivation to complete the rest of his masterpiece. She knew that in the grand scheme of things, that one small flaw didn’t matter. God is the same way. His love is unconditional. That means we don’t have to earn it. He loves us, flaws and all. All He wants for us is to stay motivated, keep growing and learning, so He can complete His masterpiece in us. When I look at Zack’s The Starry Night from this new perspective, it becomes endearing. Although he did it in second grade, it is remarkable how like Van Gogh’s it is. If it weren’t for his moon, it would be yet another attempt to copy a great artist. Instead, Zack’s version is unique, unmistakably his, and the only one of its kind that I want hanging on my bathroom wall. Of course I will still keep working on my many flaws; and maybe one day make some progress. But in the interim, I have to stop beating myself up when I stumble and fall. If I don’t, I won’t keep moving forward. I won’t be growing in wisdom and experience. Instead, I need to see myself as God does, with love and acceptance. God’s love highlights the things we do right, brings them to the foreground. When they become the focal point, our flaws get overshadowed and just blend into the background. It’s that vision that allows God to look at each one of us with admiration, the same way that I now look at Zack’s artwork and admire it. Claire, I beat myself up all the time for things I say. Constantly replaying them over and over in my mind and thinking about what I should have said. Thank you so much for posting this. It’s nice to know I’m not alone in this struggle. I will try to just move on and know that it’s okay to make mistakes! It is refreshing to hear that I’m not alone in saying things without thinking. I wish I could go back and change those times when the words were wrong. Unlike God, forgiving doesn’t come easily to everyone, unfortunately. Your words will help me to try to see me as God sees me and make the good out-way the bad. Really liked this story. We have a nice picture of Hawaii in our bathroom, but now I would prefer a Zack original . Thank you for sharing. Nice post Claire. I too beat myself up mercilessly for such faux pas. Wish I could be perfect too but self checking for motive should help you to let yourself off the hook. You had it right when you said we are all works in progress. I can’t believe he did that picture in 2nd grade. It is awesome!